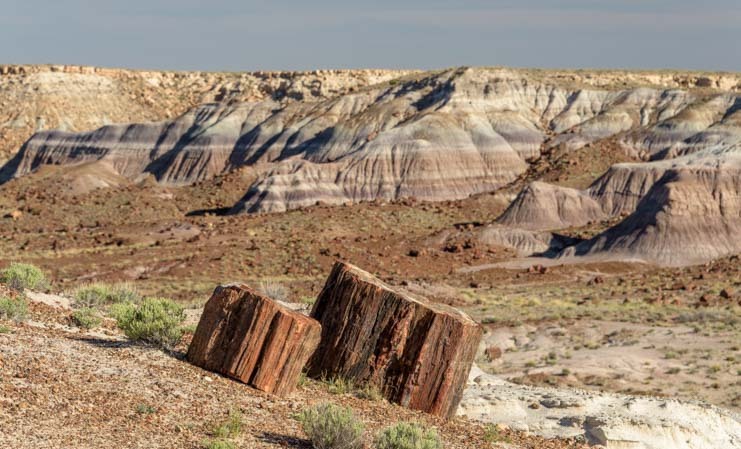 April 2017 – One of the highlights on Route 66 is the Petrified Forest National Park where the enormous trunks of 200 million year old trees have turned to stone. 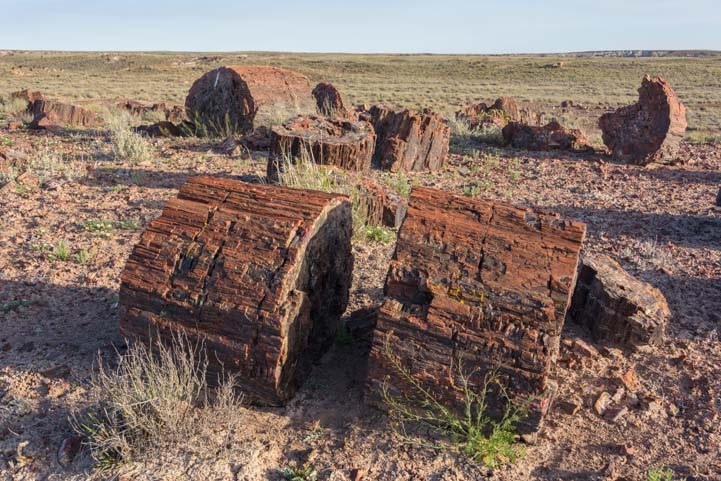 The solid stone tree stumps at Petrified Forest National Park are truly impressive! 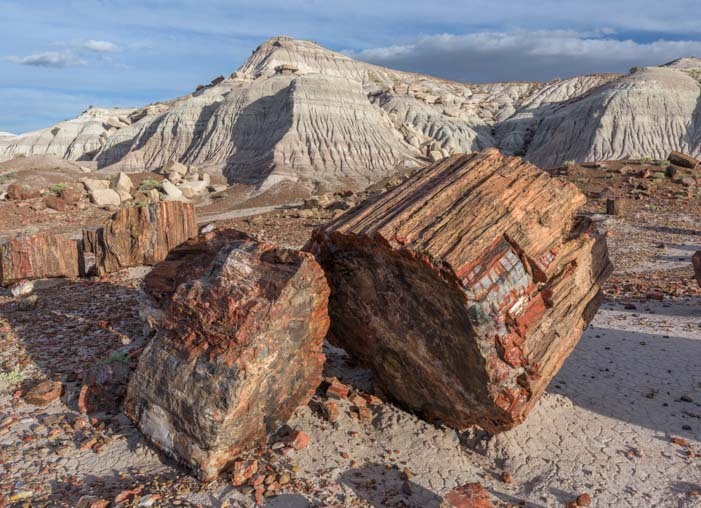 We have been to Petrified Forest National Park twice before, but it was on this trip that we finally found the true magic there. Those tree stumps are solid rock, through and through! 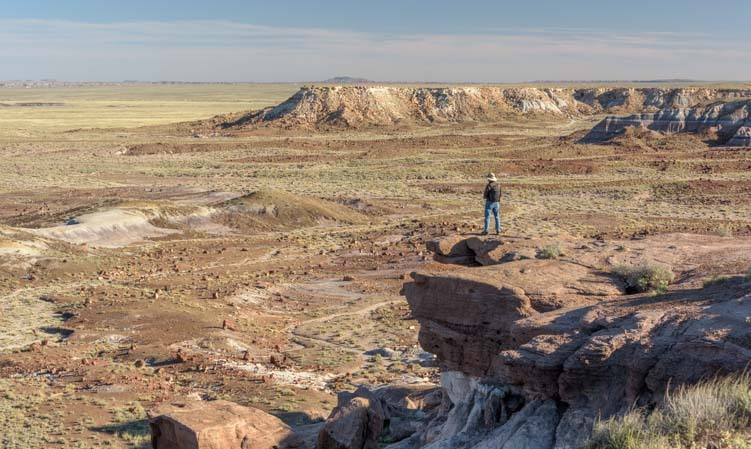 We knew that the best way to see Petrified Forest National Park, like all the National Parks, is to get out on the hiking trails away from the crowds. and revealing the tree rings — still perfectly intact — inside. But it wasn’t until this visit that we discovered which hiking trails are the most stunning. Was the woodsman just here with his ax? On our first foray into the Park on this trip we explored the area called Crystal Forest. The logs were scattered everywhere. But there wasn’t a living tree to be seen anywhere! 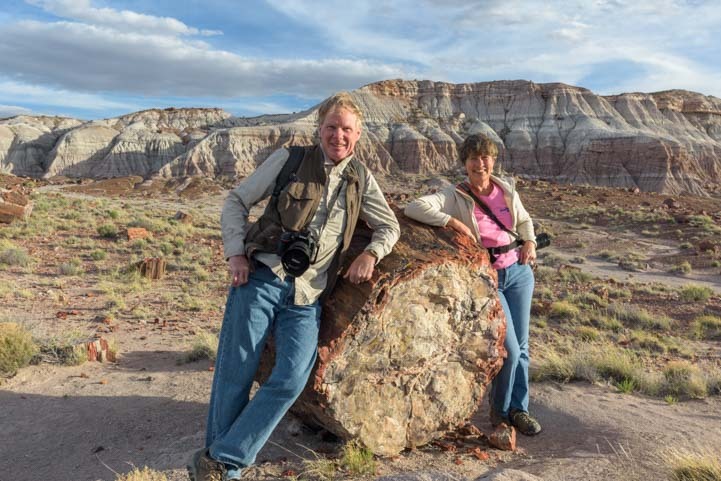 In every direction we saw the enormous trunks of trees that had been growing millions of years ago. 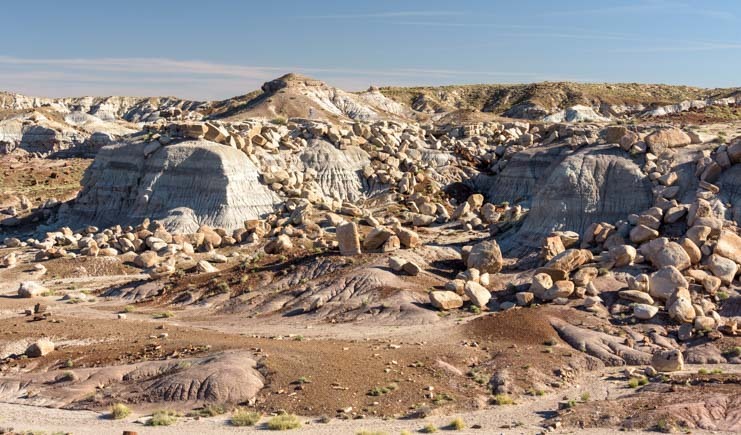 These trees had toppled over during torrential rains millenia ago, and had floated downstream only to end up in a deep and muddy logjam where they slowly and very gradually crystallized. Over time, the pressure of moisture and ice within the logs broke them into segments. 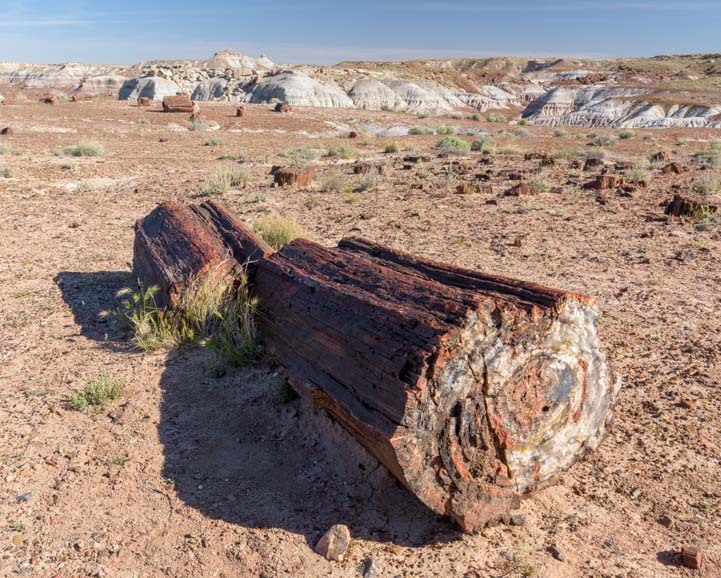 Out on the vast treeless plain, we saw countless tree trunks that looked like a lumberjack had just sliced them up with a chainsaw in preparation for splitting them into firewood! We saw many 50+ foot long logs lying on the grass and split into sections. Here and there, the stump of a tree trunk stuck up from the ground and looked for all the world like the tree had just been felled. A rock and a wildflower. All the tree rings were perfectly visible in a rainbow of crystalline colors. 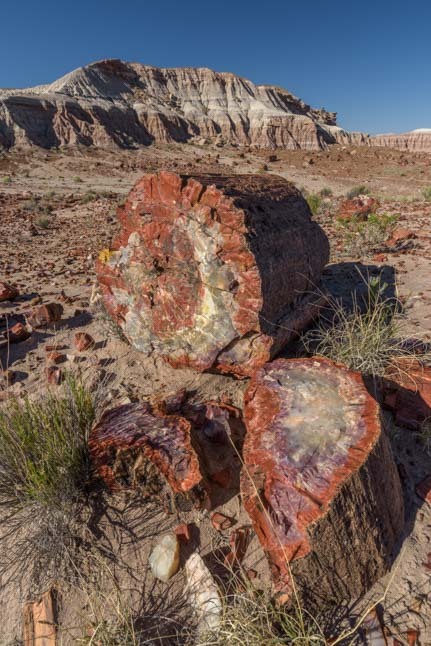 Brilliantly colored minerals have crystallized the tree rings in this ancient tree. 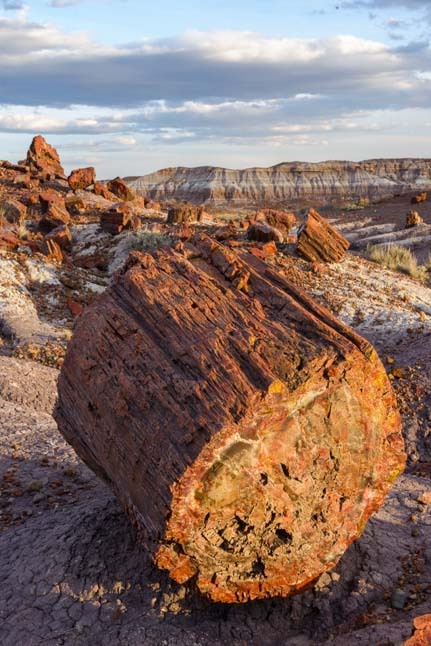 The logs lay scattered all over the place, and in between were beautiful shards of petrified wood. 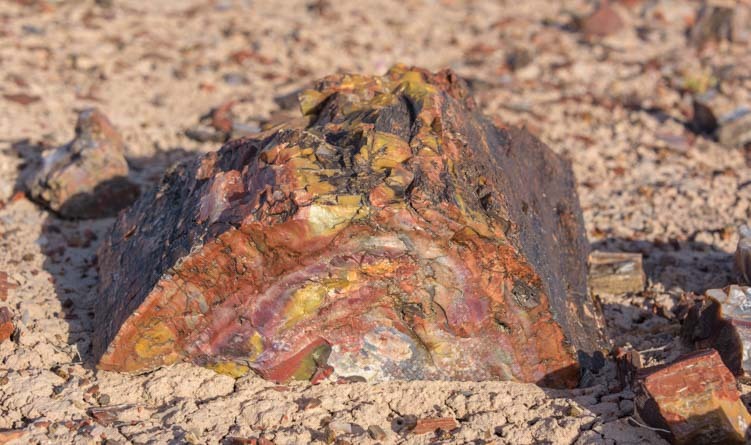 There were exquisite shards of rock EVERYWHERE as far as the eye could see in all directions. 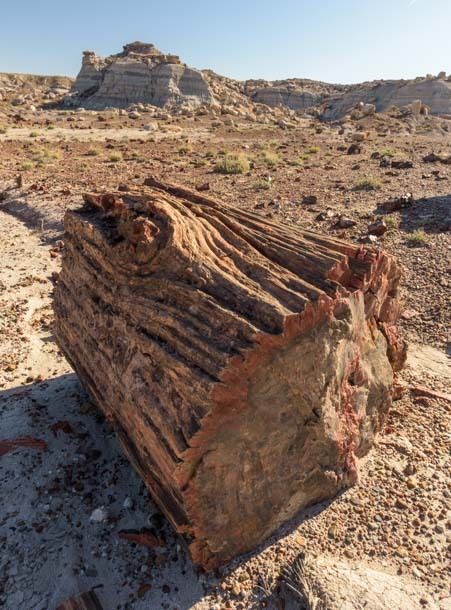 Some logs had been split so the tree rings were visible while others had been severed lengthwise showing vertical striations from the interior of the log. In one area the shards that surrounded the logs look like woodchips. It was as if the lumberjack had just laid down his ax! These pale wood chips were very thin, just like ordinary wood chips, but these slivers of rock tinkled like a bell when dropped on each other! when they fell on each other. 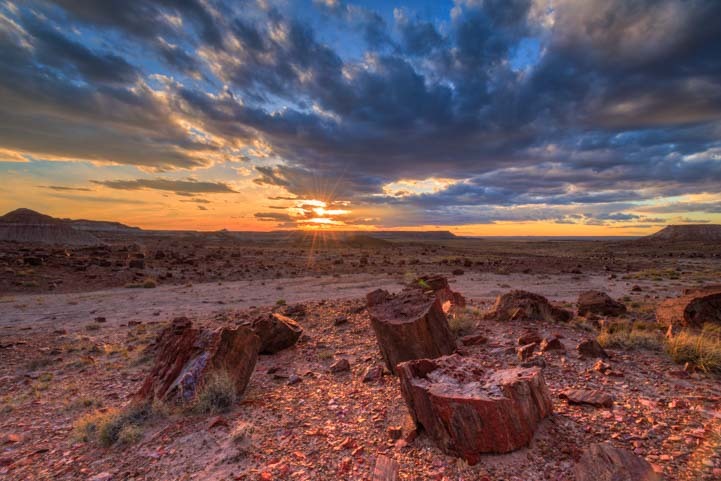 We had wandered out at the “golden hour” about an hour before sunset, and as the sun sank below the horizon we were blessed with a beautiful sunset over these exotic rocks. 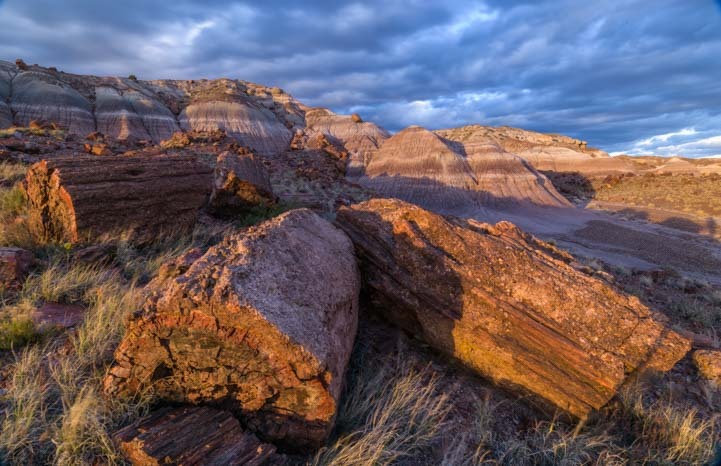 Sunset in Petrified Forest National Park. 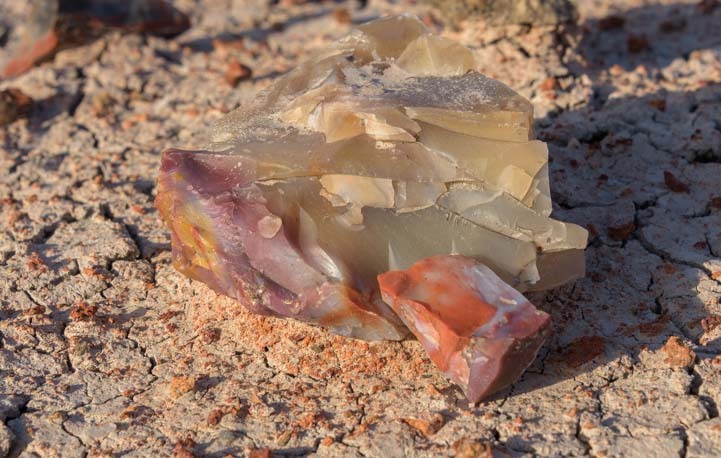 Even better than Crystal Forest, however, is Jasper Forest which is just a little further north. The overlook takes in a sweeping view. Jasper Forest overlook has an incredible view — see the logs below? — and the trail to the plain below took us down among thousands of logs. 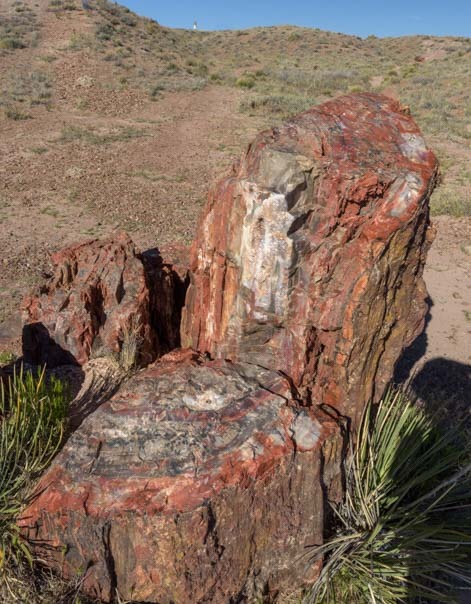 In the distance, far below the Jasper Forest overlook, boulders and petrified logs intermingled. 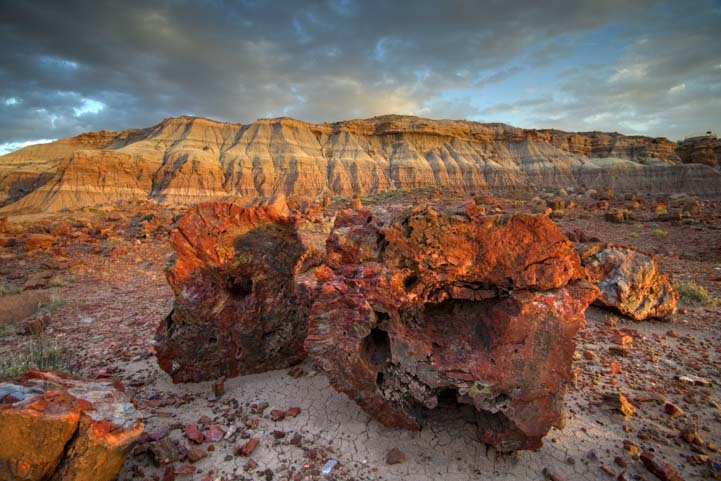 Huge waves of eroded rock formations were littered with tumbled boulders and petrified logs. 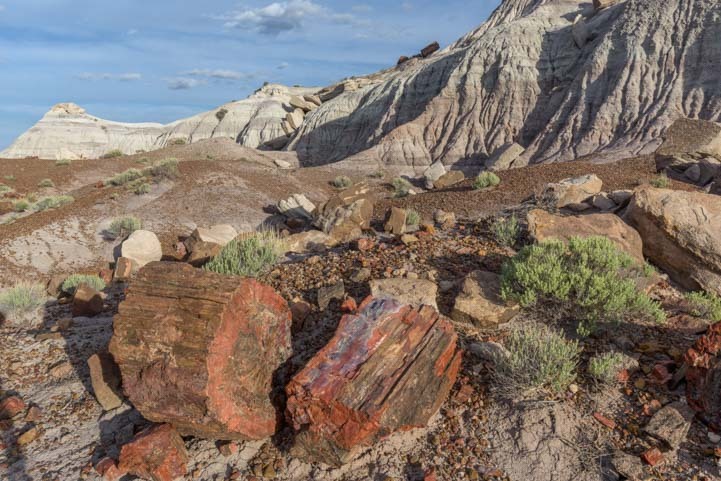 When we stopped at the Visitors Center to find out where the best collections of petrified wood were in the Park, the ranger took out a large 3-ring binder labeled “Off The Beaten Path Trails.” He took out the trail directions, complete with photos, for a few trails and handed them to us. One set was for Jasper Forest. 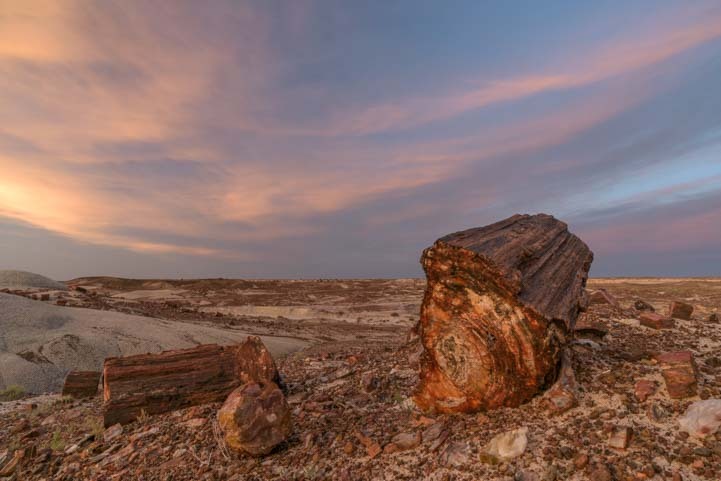 Down among the petrified logs at Jasper Forest. Go to the north end of the Jasper Overlook parking lot and look for a narrow trail heading north from the last parking space in the lot. Follow this trail north and then west onto the wide plain that stretches out below the Jasper Forest overlook. 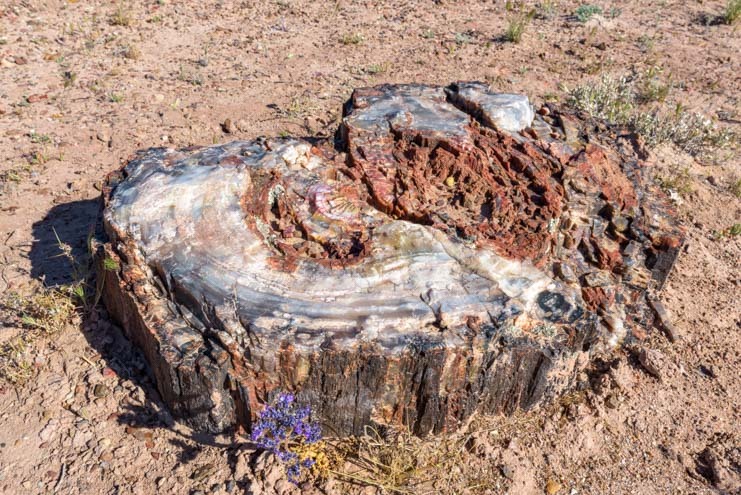 Two faces from the same log reveal gorgeous tree rings. From there you can go in any direction you want, and we quickly ran off in opposite directions! 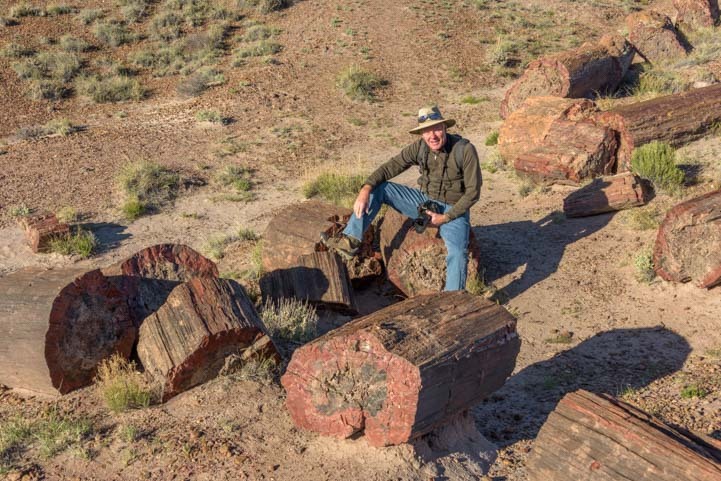 The “bark” on this 200 million year old log even had a knot in it. 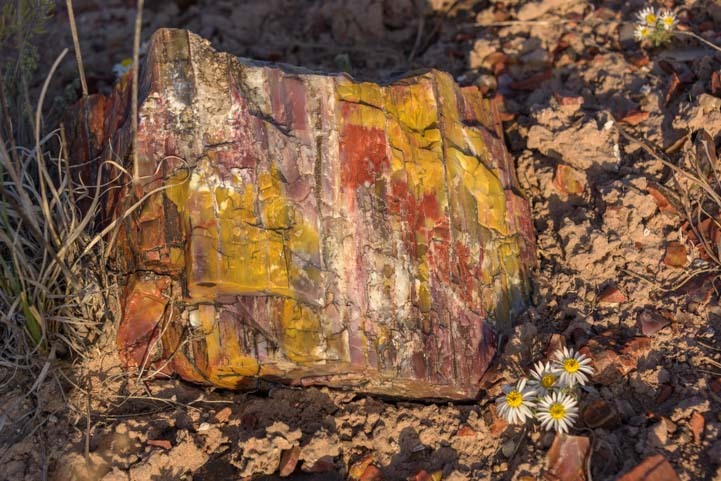 We were there in the harsh light of noon, so even though the rock logs were mind boggling, we knew they would be even more beautiful in the rich light of late afternoon. So, we returned a little later with our cameras, and suddenly the logs came alive in vivid shades. all the logs began to glow. The skies were darkly overcast but the sun snuck through underneath and cast a brilliant light on all the stone tree logs. Storm clouds darkened the skies while the sun peeked through. Looking at the tree root ends of the logs — in rich light. As the sun sank towards the horizon, we were in awe of the beauty around us. We were also frantically running around trying to capture it as best we could while the sun teased us mercilessly! At one moment the sun would pierce through the clouds and light everything up in bright orange and yellow, and at the next moment it would disappear all together behind the clouds! The clouds were flying across the sky, making an ideal opportunity to use long shutter speeds to make them blur dramatically just as the sun set in a starburst. Drama in the sky above an ancient world of stones. 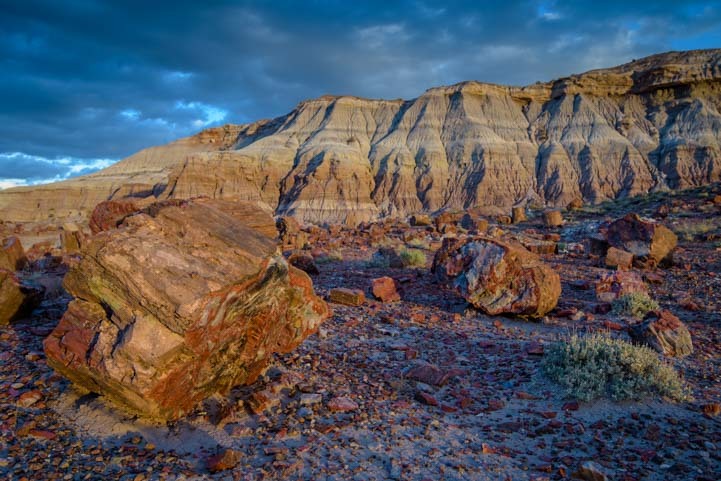 Petrified Forest National Park is a great place to go with an RV, and it is surrounded by many of the most spectacular natural wonders of America’s southwest. A motorhome passes the Crystal Forest turnoff. National Parks and World Heritage Sites – by RV, sailboat, and airplane! 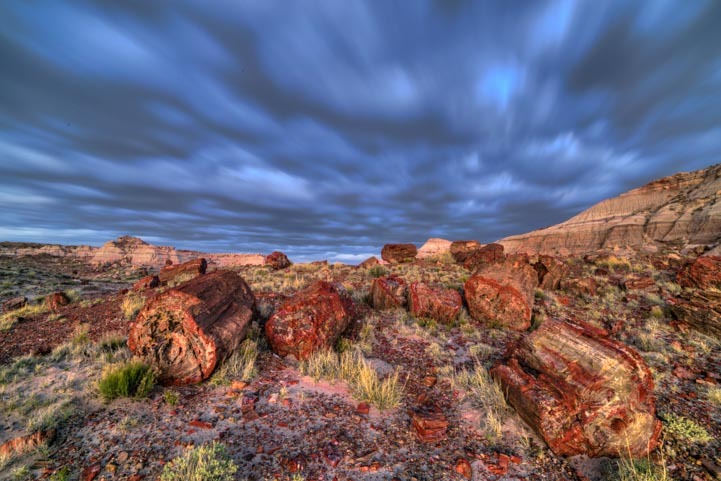 This entry was posted in Arizona and tagged Arizona, Arizona Northeast, Exotic Landscapes, National Parks US, New, Travel, USA, WP Travel by Roads Less Traveled. Bookmark the permalink. Very funny — that’s us in our best cowpoke pose!! 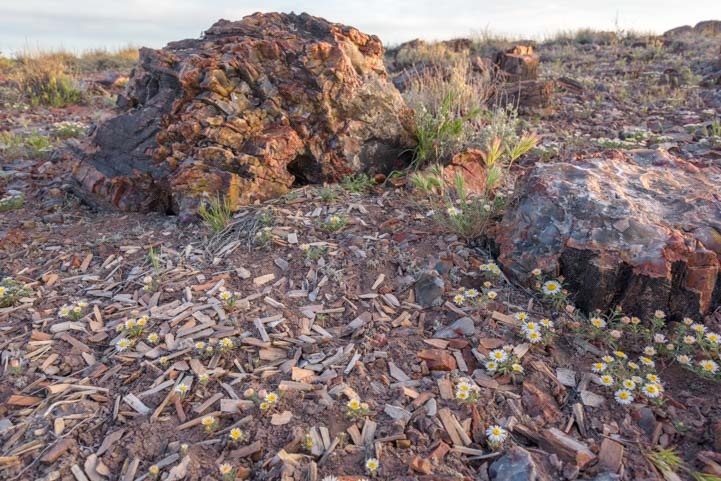 You would absolutely love the beautiful rocks and stumps. Thank you, Bob. It’s a great life, isn’t it? Enjoy the west in your TT and have fun blogging! Really great pictures – like I was there myself! My favorites are the starburst sunset and the blurry clouds (where the reds of the wood look deep & stunning). I hope to get there someday!! Thank you, Deborah. Those wonderful starburst and blurry sky photos are Mark’s and I absolutely love them too!! Like always, the photos and stories are great. 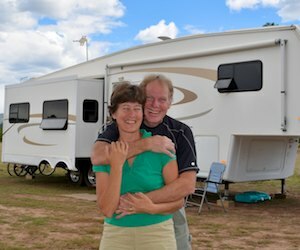 Every time I start thinking that buying an RV may not be the best option for my wife and myself when we retire I read another one of your blogs and I’m on the fence again about it. They say there is no such thing as too much fun but you two are very close to it! We love this lifestyle, Richard, but it’s not for everyone, and that’s just fine! We have friends who travel the world using VRBO to rent an apartment in some exotic locale for a month or two at a time, and we have friends who travel between two destination every year for six months at a whack. We also have friends who fly somewhere cool once a year, rent a car and then travel around for 4-8 weeks, staying in all kinds of unique hotels and B&B’s. There are lots of ways to add some adventure to your life, and we just hope our stories and photos get your creative juices flowing!! Very funny, Janet (and Steve!). 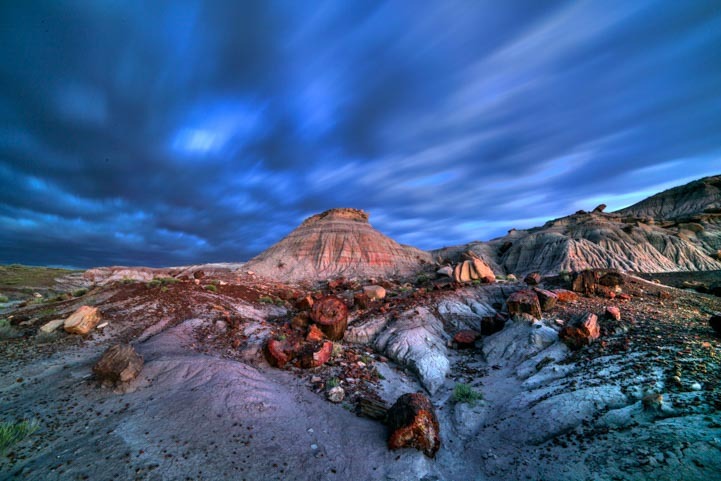 Petrified Forest is a great destination and hopefully you’ll catch it next time. In the meantime, I’m glad you could experience it with these pics (and there are more coming…)! !